Looking to diversify your affiliate program portfolio? Want to increase the potential earnings from your site? Are you running out of things to talk about with your current affiliate programs? Or are you just starting our on your website and looking for ways to monetize your site? The Shareasale affiliate networks is a great place to find thousands of potential affiliate programs to monetize your website or blog. No matter what your reason is, affiliate marketing is one of the fastest growing ways to start your own business online. Affiliate sites are cheap to start, easy to run, and much more accessible to your average “first time” entrepreneur. Affiliate marketing simply put is a system that companies put in place so that you can advertise their products on your site (without actually selling them!) by simply hyperlinking text or images on your website or social media account. When customer's go to that site, thats when the earnings start! Companies pay you either in 2 ways – Sending a customer to their website, or gaining a commission from customers who make purchases after clicking your links. It's one of the cheapest ways to start a business and you can run it from the comfort of your home without any help from anyone. Simply write articles on whatever you feel passionate about, find affiliate programs that align closely with what your passions are, and then link the different text/topics to your affiliate's website using the specialized affiliate tools – and $BAM$ – you're in business. The other reason i'm quite passionate about affiliate marketing is it really opens you up to your creative self. You can be as weird, wonky, sassy, crazy, or serious as you want on your website when writing content. The content you create will show your unique personality in it. That means you don't have to conform to any industry standard or write how your boss tells you to. Throughout this article i'm going to teach you about affiliate marketing and teach you the difference between affiliate networks and programs. I'm also going to show you one of my favorite affiliate networks which is called ShareASale. We're going to walk through everything you need to get signed up and start using it today! We've already talked a little bit about what affiliate marketing is, but thats more of the generic concept. So before we get started, lets go through what affiliate programs are versus affiliate networks. When a company decides they want to start allowing affiliate “partners” begin advertising their products and services they need to first determine if they want to build their own website and invest all of their own money/time/effort into making it, or if they want to hire an outside 3rd party company to do it for them. In simple terms, affiliate programs are singular company's affiliate accounts that you can use. Company's like Agoda, Walmart, and Etsy each have their own unique affiliate programs. You sign up using the company's website and everything is owned and managed by them. Affiliate networks are hundreds (or thousands) of affiliate programs all housed on one simple to use platform that you can get access to. Companies like ShareASale, Commission Junction, and Rakuten are some of the largest ones. Awin is another good network, but some people are turned off by the $5 fee to sign up. My thought is that if you are looking to earn $50,000, then $5.00 isn't a big deal, but I get the hesitation for newbies. Update: I just finished my Flexoffers overview, which is another place I earn commissions. Affiliate networks are slowly taking over most of the affiliate world because of the ease of use. If you sign up for an affiliate network, you only have to sign up once for that network and you automatically have access to their entire affiliate listing. You will always have to apply for each company's affiliate program, but it's as simple as a one-click process to send your application to those companies. If you're using affiliate programs right now, but haven't started using affiliate networks, you should jump right in and learn why affiliates have started to love these networks! If you're just getting started as an affiliate, then you should start with a network first and be ahead of the crowd. If you're not sure which affiliate network to use, we have put together a list of the Best Affiliate Networks for you to look through. ShareASale is one of my favorite affiliate networks to join. It has a fun and friendly interface and has so many awesome affiliate programs housed within it. 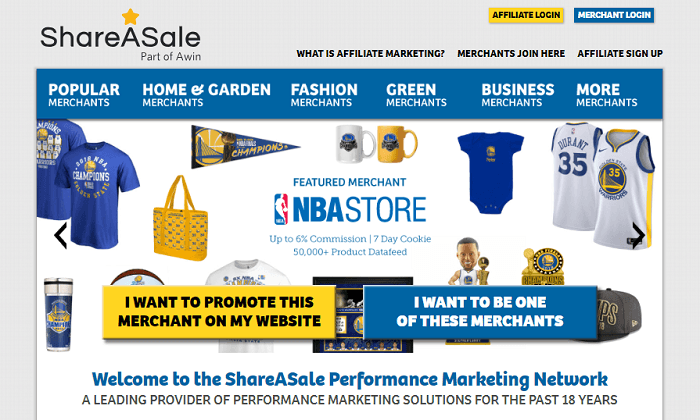 If you want to checkout the different affiliate programs, start by going to www.shareasale.com. Right on the front page you'll see two different sign up options one for an affiliate promoter and one for a merchant. Step 1: Create your user name and password that you prefer. Step 2: Enter in your website information. Step 4: This step is for your payment information which you can choose to enter now or wait. During the sign up process, you'll be asked for both your website and email address which will show if your email and website are linked together (having the same domain). If they are, then your approval process will be automated and rushed through typically being done within the day. If your email address is a generic email like @gmail.com then you will need to have a manual approval process completed and you'll have to validate how you are associated with your website. This can take a day or more to complete but instructions will be sent to your email on how to proceed. We all were newbies at one time, so if you're just starting to look into creating your own website, there are so many resources out there to help you out. We've created a few for you to help guide you in the right direction as well. If you're starting a new website, here's our guide on how to build a simple website and make money from it. But the most important part before you build your website is how to select what type of website you're going to make. You can go for what you're passionate about or what for what you know is profitable. Sometimes, they are both the same. If you're having trouble deciding, check our guide on passion vs profit here. By now, you'll have access to the ShareASale affiliate network and you're ready to get started looking for great affiliate companies. To search for affiliate programs in ShareASale, click on the “Merchants” tab at the top and select “Search for Merchants” from the drop-down menu. You'll then be taken to the find merchants section which will show you featured categories and featured merchants. You can browse some of these featured sections as they often have some of the newest or most popular merchants. If you already know of a merchant that you want to apply for you can search them in the Keyword Search box. Otherwise select each of the categories that relate to the topic of your website and the results will appear automatically. Per Sale: This is the commission rate of the program on average. This can be listed either as a percentage or a dollar amount depending on how the commission for that merchant works. Power Rank: This shows you where the merchant falls in terms of their ranking against all other vendors in terms of earnings. If your vendor is one of the top 0-999 vendors, you'll see their exact number ranking. If it doesn't fall within the top 1,000 then you'll just see 1000+. EPC: The Earnings Per Click is the average earnings per 100 customers who click that affiliate's link. If 100 people clicked the link, and their total earnings for all 100 was $1,000, the EPC would be $10. Keywords: The keywords show you what typical products/customer types are likely to purchase from this merchant. You can search for keywords as well in the search bar to find potential merchants. If you want to know more information about the merchant click on the merchant's name to open their full details. Here you'll find additional stats that you may find helpful for making your decision, and you'll find the full commission rate details. Some merchants may have different commissions for certain product types. Click on the Commission Rates tab to see the full details. Also, it's best to find a company that has an EPC of at least $10-20 otherwise you wont be making much money from customers. If you are ready to apply for a program, if you're on the search screen or on a merchant's overview, you'll see a “Join Program” button. You'll then get a pop up box that asks you to agree to the program agreement, and then optionally you can tell the merchant how you plan to advertise and promote their products on your site. Once you've entered the information, click “Join This Program” and your application will be sent to the merchant for approval. Typically if your site is related to the merchant type, you'll be approved within 1-2 days. If not, you may be declined. If you are declined, you can always contact the merchant directly by finding their contact information on the merchant description screen. Once you've applied for programs and have been accepted, they will now show under your merchants list. To find your approved merchants, click on the “Merchants” tab and select “Merchant Status” from the dropdown. From here you'll show the approved merchants automatically below. To start using the affiliate links/tools on your website so you can start earning money, click on the “Get Links” button on the right side of each merchant. You can cycle through the different link tools available by clicking the button above each of them. There are a few different link tools available but not all will be active for each merchant. To know if there are links active under each different type of tool, look for a number listed below each tool name. In the screenshot above you can see there are Text Links, Banners, and Datafeed link tools available. Selecting each will show you the ones available below. Text Links: The text links will show you different specific areas or pages within the merchant's website. This may also include links to discounts/promotions available. Usually you'll use these links on your site to hyperlink text and images to redirect customers to the merchant's website. Banners: Most merchants have banners available which are graphic images that you can use throughout your website or social media page that shows the merchant's products/services. These are great to add to your header or sidebar to attract potential customers. To use either of these on your website, you'll need to click the “Get Code” button. I'll use Banners as an example. When clicking Banners in the link tool selection, you'll see all of the banners avaialble. Simply click the banner you prefer and the code will be available to copy and paste (see screenshot below). You can then paste this code in the HTML section of your website and the banner will automatically appear. 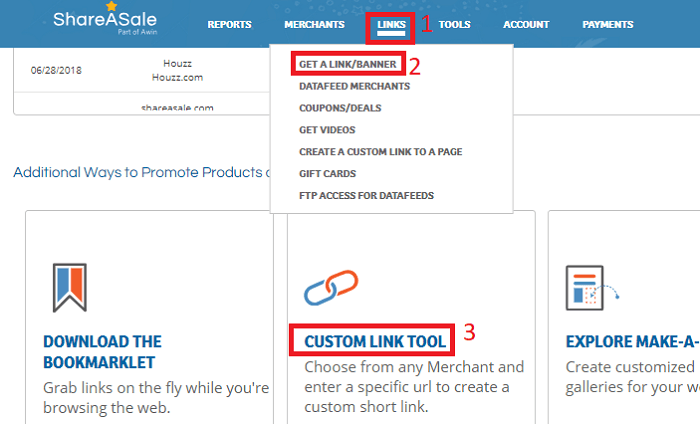 If you find that you want to link to a specific place on your merchant's website but you don't find it within the Text Link/Banners of the merchants ShareASale page, you can create your own custom affiliate links. Go to the “Links” tab and select “Get A Link/Banner” from the dropdown. Then select the Custom Link Tool. From here you'll see a box to enter the URL you want to create a custom link for. Simply enter the link and it will convert it into an affiliate link. 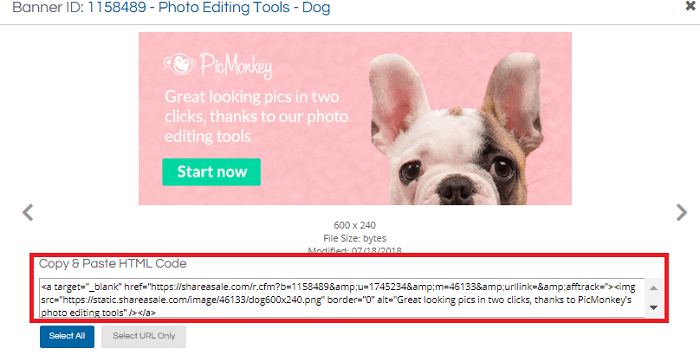 You should only use this custom link tool to create affiliate links and never use the URL from the merchants website on your page as an affiliate link without first putting that URL into the Custom Link Tool. If it does not include your affiliate ID in the URL, you will get no credit for any potential sales. When using the Custom Link Tool, you'll notice that right below the affiliate link generated is an optional “Tracking Value” field. You can use this to add a special tracking code to that link. Tracking codes are important in the long-run so you know where your sales are coming from. As your website starts to increase in traffic you'll start wanting to know where the income is being generated from. Without these custom tracking codes you wont be able to determine that. When you know what articles earn more than others, you'll know where to invest more of your time and energy into certain affiliate campaigns. Now that you know how to find merchants and get your affiliate links, the next steps are all about creating engaging content for your readers. Make sure there is always a mix of helpful information and not just selling of content/products. If there is nothing of use to your readers to take you to your page, then there is no reason they wont just go directly to the merchant and bypass your website altogether. While using affiliate networks/programs are done via websites primarily, I also add in social media always in the discussions because social media is how you get the word out. Don't forget the power of social media always when attracting potential customers. If you need additional support and resources on placing affiliate links, we have an awesome guide here on Where To Place Affiliate Links To Achieve Results. Let us know if you have an affiliate network that you love as well so we can give it a review and checkout our YouTube tutorial if you get lost along the way with using ShareASale.